If you’ve been around my blog for a while then you’ll know how much I love and admire f2o’s artistic talent and designs, so much that my book cover is actually illustrated by f2o<3 Just before Ramadan was out and everyone ready to flock the country to their summer vacations Fatima Al-Othman, the lady behind f2o, sent me a bag of her latest products: colouring books, a current trend in its own, featuring f2o’s children, Essa and Asya, with the Alphabets in Kuwaiti dialect. 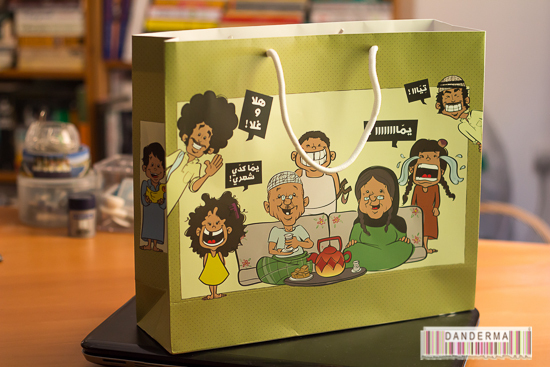 The colouring books arrived in the bag above, the bag itself is very cute, showcasing f2o’s family of characters gathered around a tea tray and looking like they were having a blast of a good time! The idea, well originally what I thought I would do, is to hold a competition on my social media account for followers with children and have them win the colouring books. That being said, I now have only a couple of colouring books left on me and they are reserved for a friend’s children already so, sorry no competition but I’ve sure made a few friends/parents happy! 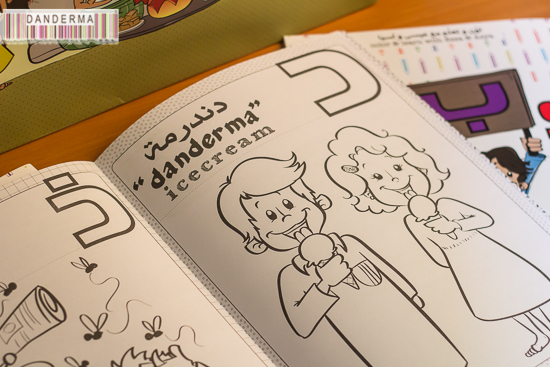 Now that the colouring book trend/craze is in full swing and this generation’s children seem to never want to tear themselves away fro the iPads those colouring books would make a good educational top, teaching children as they colour about Kuwaiti words in both English and Arabic. Not any Kuwaiti, really old Kuwaiti, some words I didn’t even know myself like bayenbagh and teena! Tha2, TH, comes with the word thoub and I was relieved! I know thoub! Really cute illustration too. Really cute, lovely f2o! Thank you for the colouring books! My favourite page was the one with the letter D obviously but overall I think this colouring book is a brilliant idea for a both a fun and educational time for the kids. It would make an excellent gift or a birthday giveaway or a school prize for doing well from teachers for example. Now my dear f2o, how about colouring books for adults? Or even your very own illustrated app for children to play with? f2o designs have recently moved shop from Burj Jassim to their new location in Symphony Mall, Salmiya and if you happen to visit Kuwait you must got and visit, they’d make a great souvenir for back home! f2o can customise your own characters and have them designed and printed in every single way you can think of and comes complete with an online shop for everything they have to sell! I’m not sure if the colouring books are available online yet or not but you can check for yourself. For more information you can visit the f2o shop, call +(965) 98750412, email f2o@f2odesigns.com, check the website (link), follow them on Twitter (@f2oDesigns), or Instagram (@f2oDesigns).